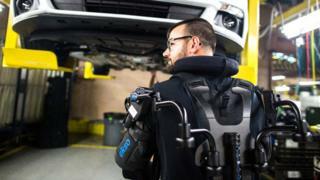 Carmaker Ford is in the process of giving mechanical “exosuits” to 75 workers at 15 of its factories globally, following successful trials of the technology. It is hoped the suits will lower injuries from repetitive motion. One industry watcher said it was a significant increase in the use of exosuits in the workplace. Ekso Bionics is the company behind the devices, which were first used at two of Ford’s assembly plants in the US. The devices also help with lifting larger under-body components into place – including skid plates and bumpers. They are not powered or controlled by an onboard computer, but instead offer passive mechanical assistance to the wearer. EksoVests fit workers between 5ft 2in and 6ft 4in tall (1.57m to 1.93m) and offer lift assistance for loads of between 5lb and 15lb per arm (2.3kg to 6.8kg). “I don’t want the EksoVest to ever leave,” said Nick Gotts, an EksoVest user who works at Ford’s Flat Rock plant in Michigan, one of the first facilities to incorporate the technology. “Everything that I’ve heard behind the scenes says that it’s all very positive,” he told the BBC.